A few of my friends and I are throwing a baby shower for another friend of ours with a super hero theme. I was excited to have a decorating project to work at so I got going on some decorations right away. 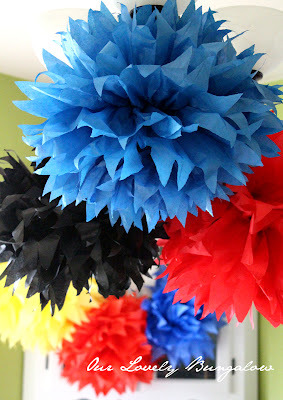 I headed over to Pinterest to browse for ideas and came across tissue paper pom-poms. I figured they were cute and I could make them in primary colors to go with our super hero/comic book theme. 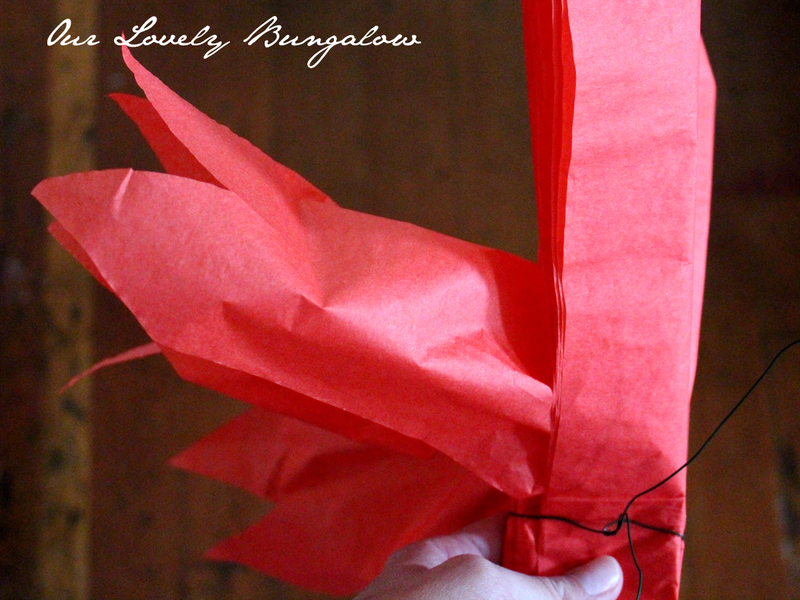 I followed a pin to a tutorial by Martha Stewart (wouldn't you know). 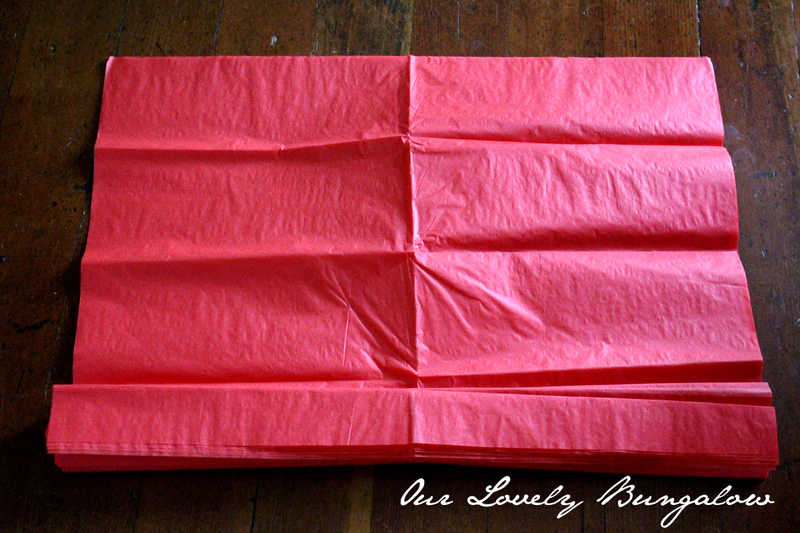 I couldn't find tissue paper in the size she recommended, everything I found was either square 20"x20" or 20"x16". 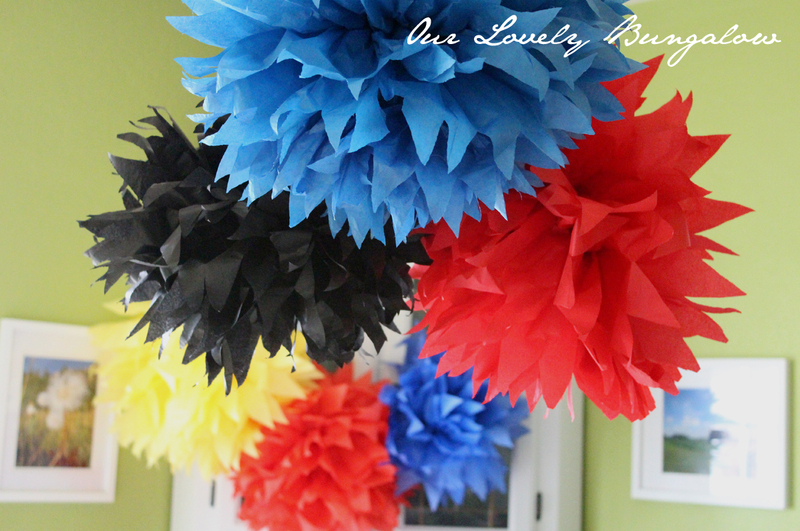 What I did learn from this is it is best to start with rectangular sheets of tissue paper as square sheets resulted in pom-poms that were not as full looking. 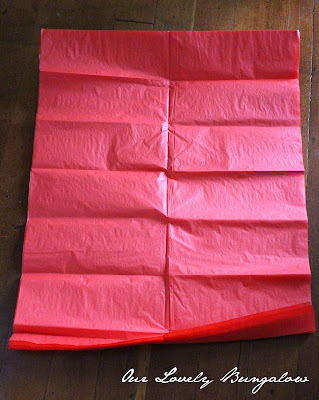 So following the instructions I stacked 8 pieces of tissue paper together (either the 20"x16" or the 20"x20" cut into a more rectangular shape). 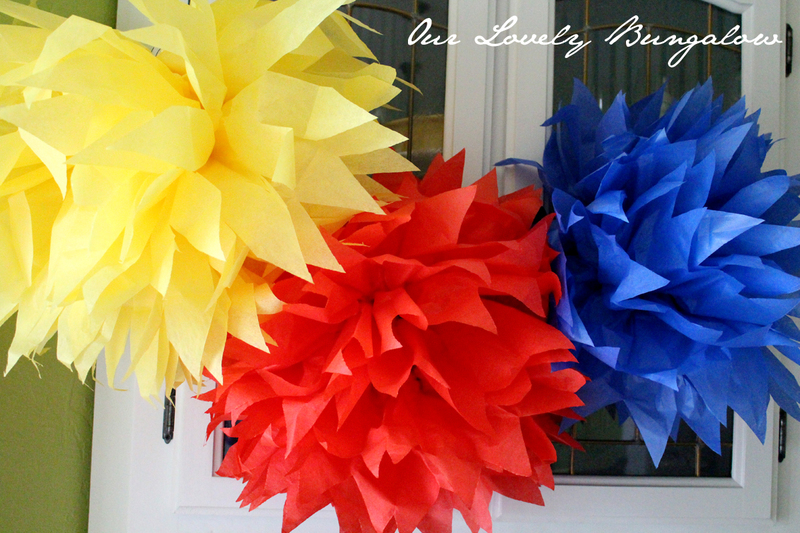 My first attempt, I didn't quite read the directions correctly and folded each individual sheet before stacking them together..............yeah, that didn't quite work out so well, my pom-pom wasn't very round or full. I also found out it's important to fold the tissue paper across the longer length (i.e. so there will be more folds, not long folds). Once again when I did it the wrong way my pom-pom failed to be the nice round and full shape I was hoping for. 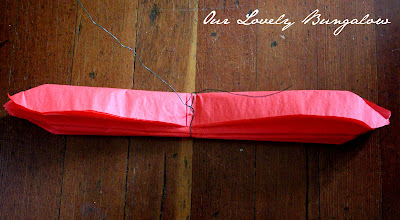 After the sheets were folded (the correct way), I used floral wire to wrap around the center of the tissue paper, with enough excess wire for hanging. Lastly, I separated each of the eight layers of tissue paper to form the pom-pom. They look fantastic. 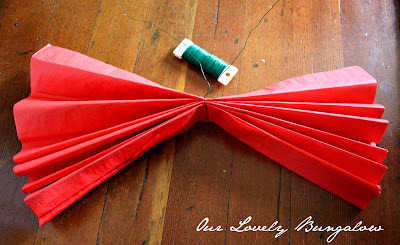 I love the pointed ends. Awesome! Those are so pretty. 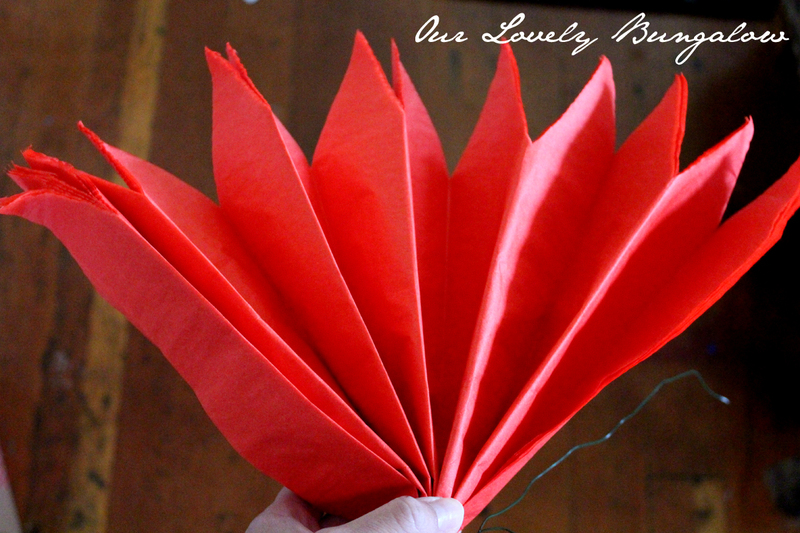 The pointed ends really give them nice detail.